This happened last week. 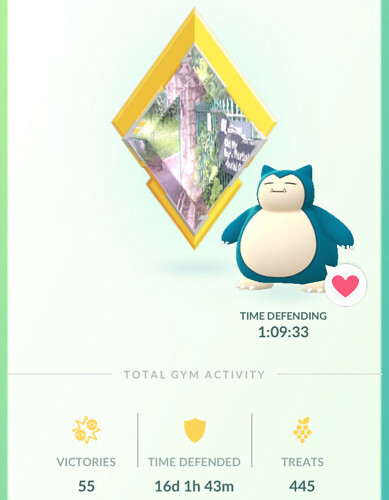 My first gold gym badge in PokéGo! Since I’m not a big raider, this took months of defending and berry-feeding. I’m very pleased. It’s also in a cemetery, which makes my eldergoth heart sing. I wish to thank the PokéGo friends who have been continuing to send me gifts this week even though I’m unable to reciprocate, due to single-parenting and not travelling into the city. You’re keeping me topped up with Pokéballs and berries, which is very useful when you’re stuck out in the countryside with only two Pokéstops within a kilometre. Thanks to you and the eggs in your gifts, and the recent release of Alolan Geodude and Alolan Diglett into the wild, I now have all the unevolved Alolan Pokémon forms that are presently available. (Evolution awaits the use of a Lucky Egg, which I haven’t had time to do.) I will shower you all with gifts as soon as I’m able. Has anyone been able to participate in Professor Willow’s Global Challenges? I’ve not been able to visit Pokéstops during either of them, because they happen on weekends and I’ve got my hands full then. So I haven’t done any of the special research tasks. :( I noticed there were a lot more interesting things around to catch this weekend. Torchic, Seedot, and Voltorb, for instance, were appearing canalside, which they very rarely do. Anyway, if you have been able to participate, share your experience with me, please! This entry was originally posted at https://nanila.dreamwidth.org/1174189.html. The titration count is at .0 pKa.